Whether you call it the award-winning "Chandel-Air" or a "Fan-Delight" you can be the first kid on the block to enjoy the ambiance of light diffused through a rustic silver mica shade featuring pine cones and pine branches. 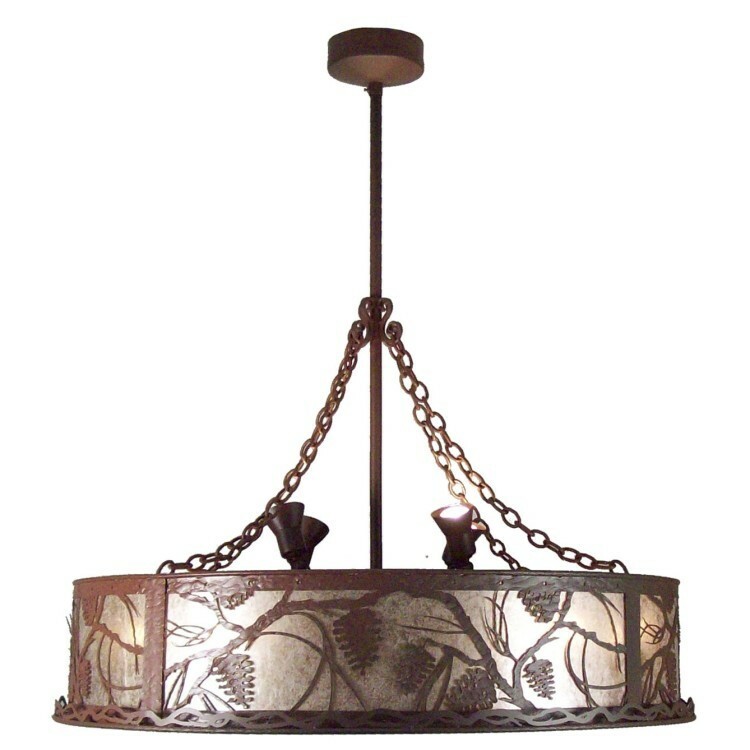 Whether you call it the award-winning "Chandel-Air" or a "Fan-Delight" you can be the first kid on the block to enjoy the ambiance of light diffused through a rustic silver mica shade featuring "Barkarized" pine cones and pine branches on the Whispering Pines Chandel-Air with Uplight. Gentle breezes are produced from the 29" max air fan spinning quietly in the center. hand finished in mahogany bronze. Can be adjusted to accommodate flat or vaulted ceilings of any pitch or height. Operates with optional 2-circuit remote control with 3-speed fan control and dimming capabilities up to 200 watt maximum. Additional illumination comes from 4 up lights that cast light up to the ceiling. Shade Size: 44" x 18"